The materiality matrix has become a familiar sight in corporate reporting. Unfortunately, proper design and use of the tool is still not common practice. In most cases it represents a selection of topics that generate impact on the company and that are relevant to its stakeholders, but interesting (and not so interesting) mutations are also found frequently. Apart from struggling with definition issues which illustrated in the Statement of Common Principles of Materiality of the Corporate Reporting Dialogue (refer to download), the innermost intricacy that is found in materiality matrices is that they are defensive by design and as a result, are insufficiently looking for opportunities. In many cases, the definition of the “impact-axis” of the matrix predominantly covers risk while the chances for eco-efficiencies or innovations are overlooked. As a result, companies end up with a materiality matrix that is viewed and applied as a stand-alone reporting tool that is not embedded in the business strategy design process. 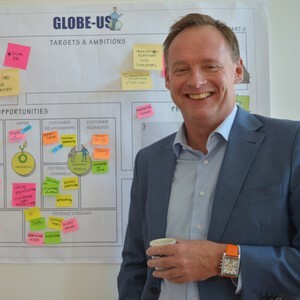 Making the materiality matrix more relevant to the board essentially means reframing it in core business terminology; away from the green jargon. This can be as simple as mapping the company’s strategic must-win battles with the identified material issues. 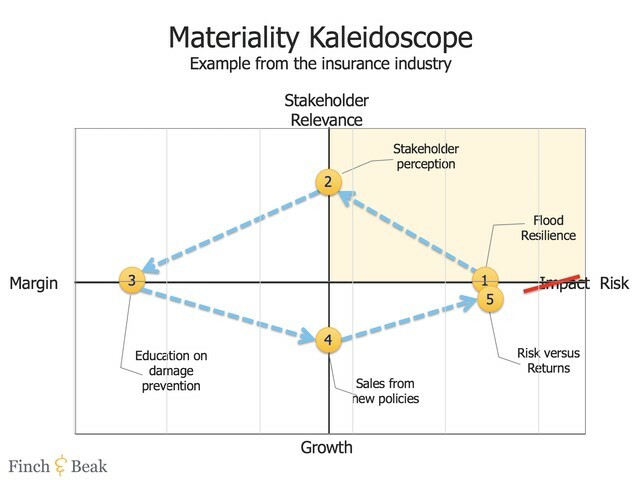 A more telling and elaborate way of engaging the board is developing the materiality kaleidoscope: a decomposition of the matrix itself by splitting the somewhat vague “impact-axis” into three distinct, recognizable elements: Risk, Margin Improvement and Growth Potential. Let’s look at a simplified step-by-step case from our practice sourced from the insurance industry as an illustration. As stated, risk is all too often occupying the original spot on the “impact-axis”, so not much work needed there: the topic of flood resilience is a clear risk for an insurer that is active in the agro-sector. Stakeholder relevance is represented by the original research data for the materiality matrix. The margin coming from existing policies can be improved by developing educational tools that enable farmers to take better measures to reduce the effect of floods. Growth can be achieved by developing services with a better market fit and by finding new niches due to the increased know-how of this segment of the market. Finally, the risks and returns are to be compared resulting in a trade-off of sustainability initiatives. By repeating this process for the other relevant materialities (such as the changing demand in mobility), a future value of the transitioning process can be estimated and presented. Of course not all materialities are as easy to assess, and sometimes benefits from growth and margin improvements can be found in more unlikely places. 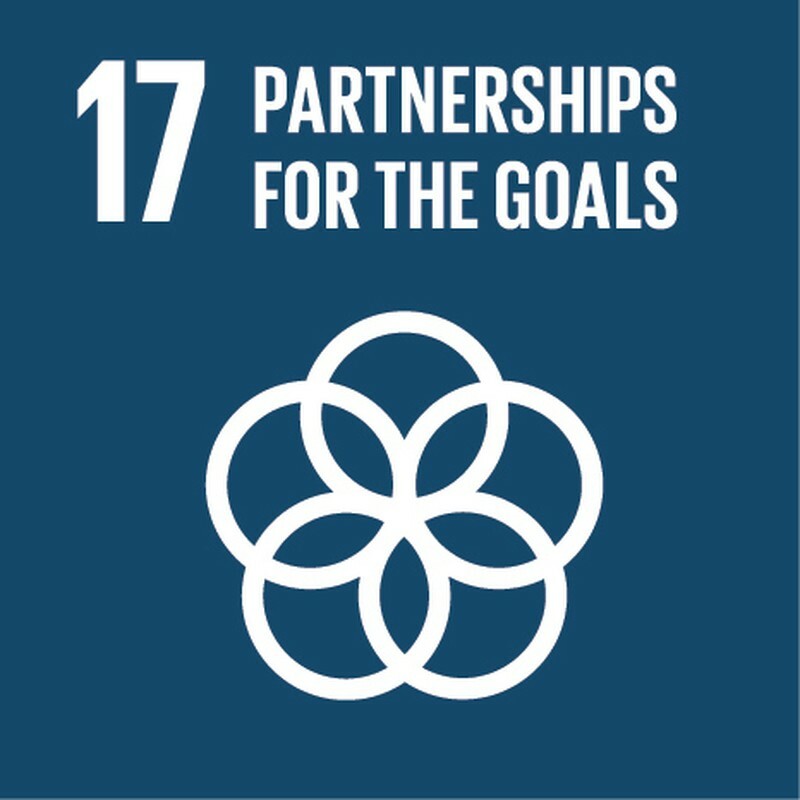 The 2014 Harvard Business Review article “Sustainability a CFO Can Love” by Kurt Kuehn, Chief Financial Officer at UPS, provides some strong suggestions where to look for benefits, for instance by generating lower-cost access to cash, materials, or supplies on a sustainable basis, or by leveraging the existing stakeholder network. As it appears, innovations from sustainability, whether they are sustainability-relevant, sustainability-informed or sustainability-driven, come in many shapes and sizes. Can this be applied at your company? Finch & Beak has 20 years of experience in generating value from sustainability. 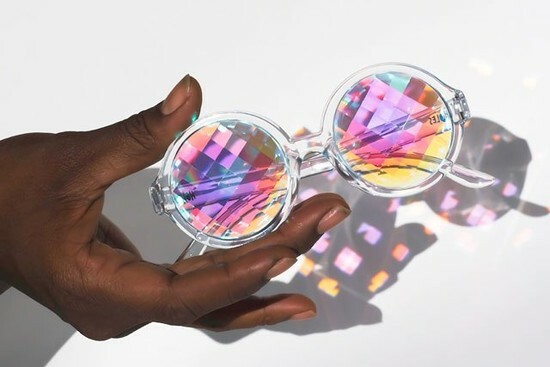 Should you be interested in applying the materiality kaleidoscope at your company, or in exploring other opportunities for sustainable innovation, please contact Josée van der Hoek, at josee@finchandbeak.com or call +31 6 28 02 18 80.